a biography of alicia’s life. 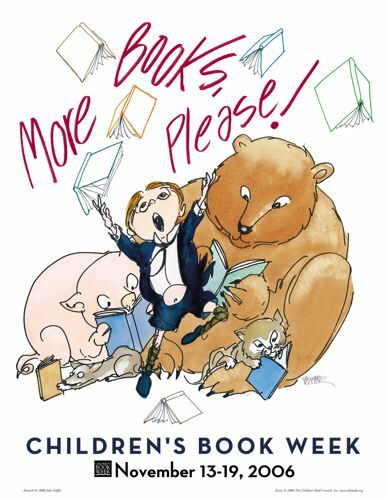 Posted on October 27, 2010 by Alicia Bay Laurel	in Blog and tagged biography. IÂ’ve done a lot of art collaborating in Japan via internet this year, thanks in great part to my art agent, Keisuke Era, who is also the director of Kurkku, an arts and environmental action center in the Harajuku district of Tokyo. Kurkku is funded by Artist Power Bank, a not-for-profit with impressive environmental protection projects like Pre Organic Cotton. When Artist Power Bank (aka ap bank) held their annual summer rock festival in 2009, I was hired to design a jacquard towel and a t-shirt drawing as festival merchandise, and, of course, both were made of organic cotton. 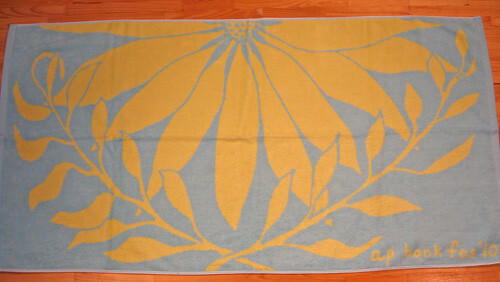 Here is the 2010 festival towel, designed by Aiko Shiratori of Artist Power Bank, using a drawing she requested from me of a large flower (I made an Echinacea blossom). Keisuke said the festival looked like a field of yellow and blue flowers, so many of the attendees had them wrapped around their shoulders. Here are my collaborators. The gentleman on the left is Keisuke Era. 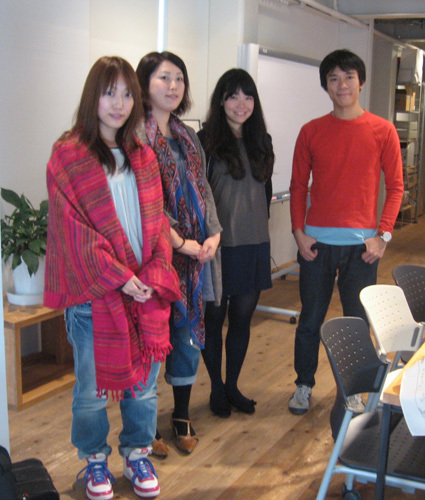 On the right side, in the red shawl is Kurkku’s Miyumi Ichikawa and, to her left, Yoshiko Takeuchi. Next to them, in very dark blue, is Aiko Shiratori, who designed the merchandise for Artist Power BankÂ’s festival this year. Posted on September 14, 2010 by Alicia Bay Laurel	in Blog and tagged biography, press releases. The autobiographical patchwork crazy quilt that I made between 1967 and 1974 will be on display in the lobby of the historic Mills Building in downtown San Francisco from October 18, 2010 to January 15, 2011 as part of a show called Â“Still Crazy,Â” which includes Victorian and 20th century crazy quilts, loaned by the San Jose Museum of Quilts and Textiles. Deborah Corsini, curator at SJMQT, created the show. If you are in San Francisco, please come see it! 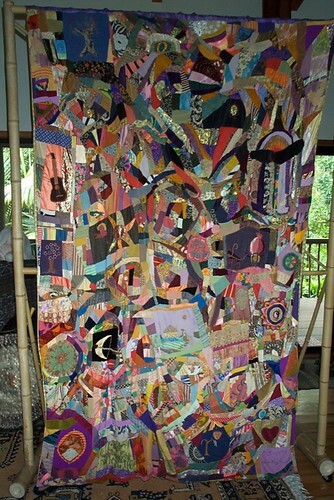 The piece is 8 feet high and 5 feet wide, and contains “guest embroideries” by author Ray Mungo and composer/author Ramon Sender, as well as a small piece by Santa Cruz quilter Charlotte Lyons, who lived at Wheeler Ranch commune when I was writing and illustrating Living on the Earth. “Alicia Bay Laurel’s crazy quilt is an excellent example of a 20th century crazy quilt from the decades of the 1960s – 1970s. It is composed of a multitude of irregularly shaped fabrics, many typical of the time period. There are large scale printed florals and smaller ditsy prints as well as embroidered and woven lace. Many of the blocks contain unique and personal appliqued and embroidered scenes. Some examples that clearly reflect on the universal (and astrological) themes that were of interest at the time are a God’s eye and embroidered solar system, a bull (her sun sign), and a flying lion (for Leo rising in her natal chart.) Other blocks charmingly depict the Sausalito houseboat where she lived in 1967 and her guitar with “real” strings. Like the crazy quilts of the 19th century, the one is filled with symbolic and personal references, and clearly references the cultural influences that were surrounding her. Most importantly, this quilt has an embroidered date, 1967 – 1974, and an embroidered signature, Alicia bay laurel, which gives it true authenticity. 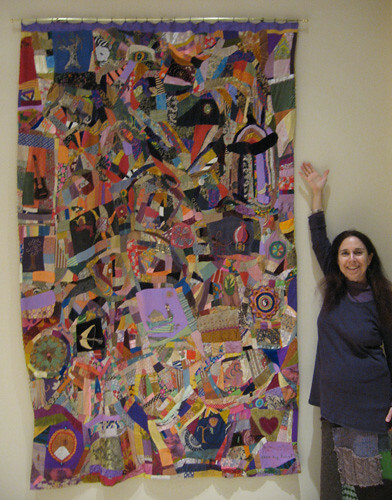 Here I am on the last day of the show, January 14, 2011 with my quilt. You might find a few differences between this one and the one at the photo at the top, which was taken in 2002. That’s because the quilt suffered some damage in 2008 and has since been expertly restored by Karen Stern at her quilt and textile restoration studio in Berkeley. Posted on September 12, 2010 by Alicia Bay Laurel	in Blog and tagged biography, press releases. What an amazing 11 weeks that was! I am resting up after my flight back to the USA and contemplating the joy and wonder of it all. To read this schedule in JAPANESE, click HERE. The closest train station is Musashi Koganei on the Chuo line. 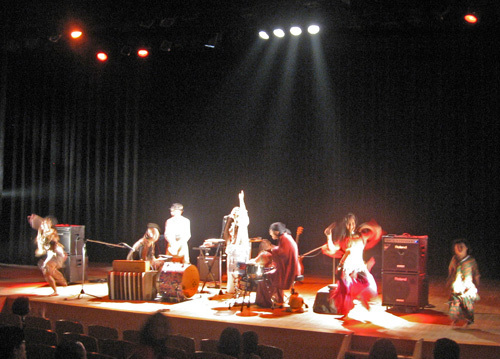 With tribal stomp and trance band RabiRabi x Piko, and local percussion band Awa Lion. There will be 3 or 4 other acts on before me (I go on last). Yukotopia is a cosy room with lots of psychedelic ambiance and welcoming friendliness. It has a full bar and offers some inexpensive entrees and snacks. People bring their kids sometimes. It hosts poetry readings on Saturday afternoons. Here I am on October 22, 2010, singing Floozy Tune at Yukotopia. Roku, the manager of Yukotopia, and I play “Ripple in Still Water” by the Grateful Dead to close my set. October 29-31 Â“Happy Flower Seed PartyÂ” (spiritual retreat) at Donto-in, Tamagusuku, Okinawa hosted and lead by Sachiho Kojima. 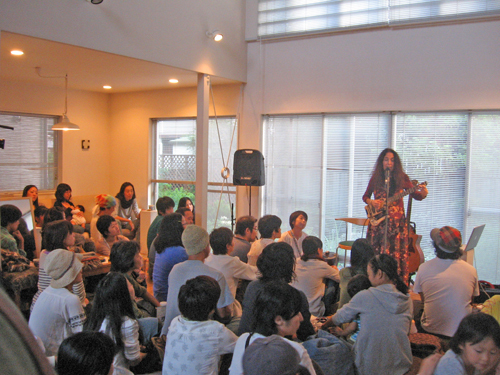 Unplugged Concert with RabiRabi x Piko, Lakita Kudomi, Sachiho Kojima and me on 10/29. I teach an art workshop on 10/31. Please contact me if you’d like to join us! A typhoon postponed the outdoor concert at Hamabe No Chaya from 10/29 to 10/31, so we had an unplugged indoor candle light concert at Donto-in on the 29th in addition to the outdoor show on the 31st. Hamabe No Chaya is a tea house with windows looking out over a calm bay enclosed by a coral reef. The stage was actually erected on the sand below the high water line, at low tide. The first act was a wonderful Okinawan traditional singer, next Sachiho played her lyre and sang spiritual songs, then I played guitar and sang original songs, and last RabiRabi played and everyone else danced. The workshop included Sachiho’s sacred sites of Tamagusuku tour, this time augmented by the presence of Professor Hiroshi Nago, who has researched and written extensively about the Tamagusuku castle ruins. He brought a slice of a rare seashell that is found on the outside of the coral reefs in Okinawa, and showed us that the entire structure of the castle is based on the structure of this shell. I lead the workshop participants in making visualization altars from found objects, including shells we picked at the beach. I was astonished, when each person shared after building his or her altar, how deeply we are all thinking and feeling after visiting the sacred sites of Tamagusuku. 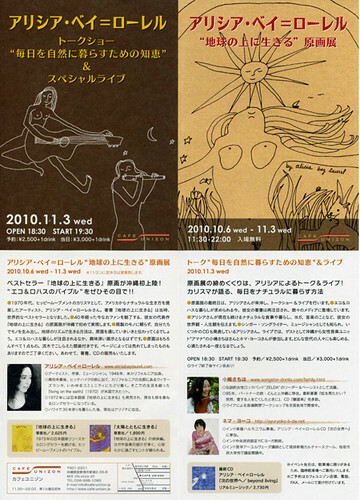 November 3 Concert at CafÃ© Unizon in Ginowan, Okinawa, on the closing date of a one-month art show of original drawings from Living on the Earth. Alicia Bay Laurel plus all-woman trance band Amana. Cafe Unizon’s sophisticated and comfortable room has a big view of Ginowan city, with the ocean in the distance. They always have an art show installed, lots of great books for sale and excellent food. 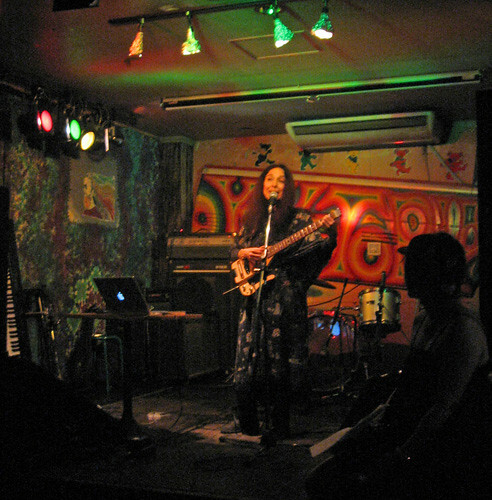 Sachiho (on electric bass), Yoko Nema (on harmonium) and I had a great time playing original songs together. Mingo Kazumi did an improvisational modern dance to my autobiographical song 1966. Yoko lead a yoga breathing session between the session in which I talked about my art and the session inwhich she and I and Sachiho performed. Mieda-san, the owner, invited me back for next year! Alishan Organic Center is a beautiful building overlooking a river. It houses an organic food wholesale and retail company owned by Jack Bayles, and a cafe and event space, where art classes, healing classes, and other community events are held. If you shop for organic foods anywhere in Japan, you are likely to find their products. Alishan is named after a mountainous area in Taiwan, the birthplace of Jack’s wife. 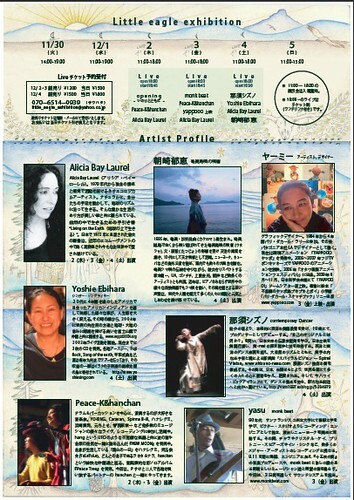 At 11 AM, Liane Wakabayashi will present her fascinating Genesis art workshop at Alishan, and at 3 PM I’ll sing my songs about the natural, organic life that Alishan Organic Center is all about. For my concert, admission is 1500 yen, and includes a beverage. Liane’s workshop also has an admission fee of 1500 yen and includes tea service. Liane and I had a wonderful day together riding to remote Hidaka village on the train and doing our respective events. I had a standing room only audience, and Mingo Kazumi came all the way from Tokyo to dance for me on the song 1966 again. Jack invited me to come back and perform next year! 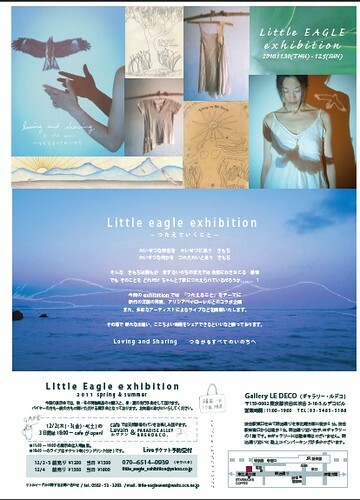 December 1 Opening at Gallery Le Deco, in Shibuya, Tokyo, of a new fashion line by Kaorico Ago owner/designer of Little Eagle and Lotus Heart fashion labels, some printed with drawings from Living on the Earth by Alicia Bay Laurel. 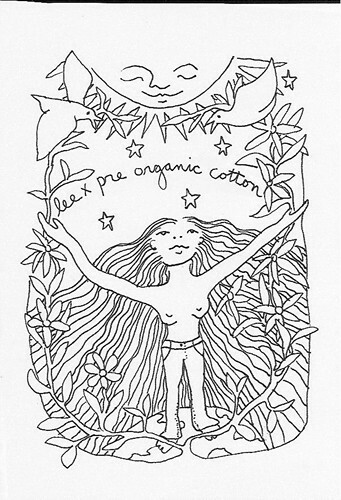 The garments are manufactured from organically grown cotton and linen and hand sewn in a fair trade factory in India. The show will also feature framed original drawings from Living on the Earth. There will be no music on December 1, but the next three nights there will be plenty! Gallery Le Deco is on Meijidori, about one minute walk from the new south entrance to the JR Shibuya Station, or a five minute walk from the east entrance. Phone 03 5485 5188. December 2 show begins at 6:30 PM (18:30) with a hula kahiko halau (group) in performance, followed by a musical performance by Peace-K and Han-chan, and after that, an hour of Hawaiian songs and slack key guitar by Alicia Bay Laurel. Admission is 1200 yen in advance or 1500 yen at the door. December 3 show begins at 6:30 PM (18:30) with the band Monk Beat, then Peace-K and Han-chan, and then Yammie, the creator of the Yappooo television series for children, will show a video of her latest work. 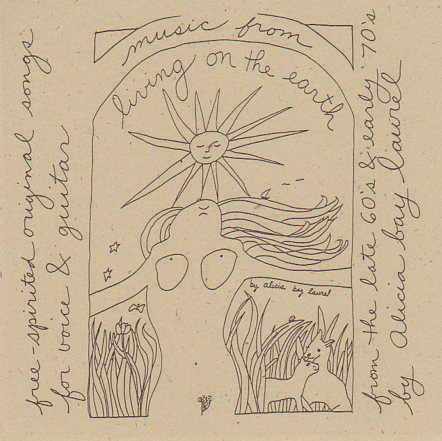 At the end, an hour of songs about the natural organic life by Alicia Bay Laurel. Admission is 1200 yen in advance and 1500 yen at the door. December 4 show begins at 6:30 PM with a modern dance by Shizuno, a dancer based in New York and Hawaii. Next, the wonderful singer/songwriter Yoshie Ebihara will perform. 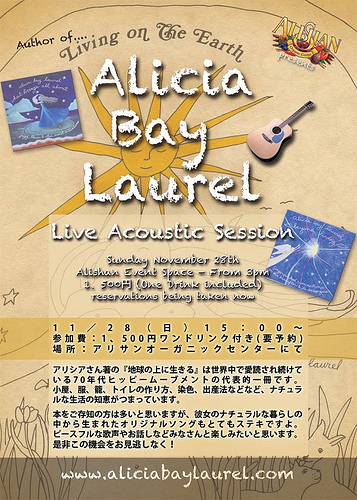 After Yoshie, Alicia will perform 45 minutes of original music, and finally, the great traditional Japanese vocalist Ikue Asazaki will thrill us with her songs. Admission is 1500 yen in advance and 1800 yen at the door. Advance tickets may be purchased at Le Deco Gallery. This had to have been the most astonishing three days of my life. Each night the place was packed, and on the last night there were lines in the street of people waiting to come in, including many of my dearest friends. The staff had to take the potted plants out of the gallery to make room for everyone who wanted to stand. I can’t take credit for this; the line-up on that night was stellar, and three very famous singers, Ua, Ikuko and Sandii Manumele came and performed in addition. Posted on May 17, 2010 by Alicia Bay Laurel	in Audio/Video and tagged biography. On May 17, 2010, I will be interviewed by my friend Jack Enyart, renowned animation artist, writer, agent, consultant, and teacher, overall "man about ‘toon" in Hollywood, on his bi-monthly webcast "Art With Enyart." Jack will focus on my art career and art methods ("the things other artists want to know"). At the end I will perform one of my songs. The webcast will be posted for, well, a long time afterward, at LA Art Stream, or at this page, where Jack’s previous interview programs are also posted. Posted on August 9, 2007 by Alicia Bay Laurel	in Music and tagged biography. Marinated from birth in the world music, classical music, jazz and Broadway tunes my parents played on the hi-fi, I succeeded (after two years of begging) in starting piano lessons at age seven, mastered the Bumble Bee Boogie by age twelve, and was levitated into learning guitar and writing songs when I saw Bob Dylan play, shortly before I turned fourteen. A couple of years later, my cousin Jan Lebow married John Fahey, and one day I cornered him when he was bored at a family party and got him to teach me open tunings. That became my sound. Most of my musician friends played rock and roll, so I was overjoyed when I first visited Hawaii in 1969 and discovered that open-tuned guitar picking was the national music. Between 1969 and 1974 I enjoyed a phenomenal career as a bestselling author, illustrator, book designer and media icon for hipdom and sustainability. My book Living on the Earth was the first paperback book ever on the New York Times Bestseller List, and it’s still in print in English, Japanese and Korean. I wrote, illustrated and designed eight more books, appeared on talk shows, and got written up in lots of magazines. In 1974, I moved to Maui. There I learned to play slack key guitar and sing Hawaiian songs from some of the most soulful people I’d ever met anywhere. I learned to sing in Hawaiian from recording artist G-girl Keli’iho’omalu’s mother, legendary singer and choreographer Auntie Clara Kalalau Tolentino. I learned slack key guitar from Clara’s son-in-law Jerome Smith in Hana, and from Uncle Sol Kawaihoa in Wailuku. In the early ‘80’s, I began playing in restaurants and bars for the tourists. Over a period of twenty years I studied vocal technique with five teachers, including pop singer/songwriter Pamela Polland. (I STILL take vocal tech lessons!) My lifelong love of jazz (the first LP I bought at age 13 was Local Color by Mose Allison) led me to learn a repertoire of standards and the jazz chords I needed to accompany myself. In the late ‘80’s I started playing at weddings and learned love songs of many genres. From 1988 to 1999 I owned a wedding business that put on 3000 weddings, and I sang at hundreds of them, sometimes accompanying a troop of hula dancers. In 2000, Random House released the thirtieth anniversary edition of Living on the Earth. I sold the wedding business and went on tour for eight months with an original one-woman show of comedy stories from my life and folk songs I wrote during the time I created the book. I self-produced Music From Living on the Earth, a solo CD of these songs, to sell while on the book tour, and, to my astonishment, it was not only reviewed but selected as an album pick on All Music Guide. Then a psychedelic folk radio show in Belgium started playing it. Then a Japanese record company released it. When I returned to Hawaii from the tour, I self-produced Living in Hawaii Style, a CD of original and historic Hawaiian songs, mostly slack key guitar and tropical jazz. The CD features Sam Ahia, arguably the best jazz guitarist/vocalist in the islands, and Lei’ohu Ryder, a reknowned spiritualist and chanter with a string of fantastic CDs of her own. This CD got airplay both in Hawaii and on the legendary Ports of Paradise radio show in California, was released in Japan, and, in July 2002, I was the only woman headlining at the Big Island Slack Key Guitar Festival. 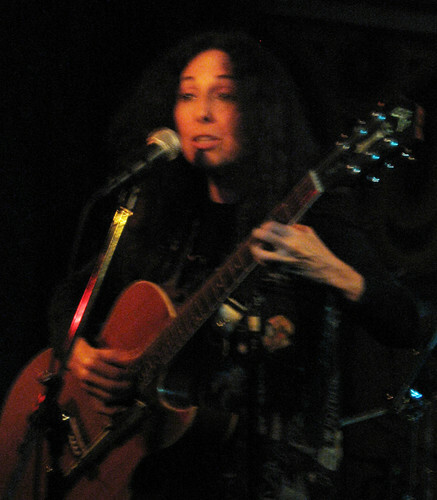 I toured in Hawaii and California to promote this CD with a new one-woman story and music show. I’ve spent a lot of time around avant-garde improvisational musicians in my life. I lived with Ramon Sender, one of the founding composers of the San Francisco Tape Music Center in the early ‘60’s, and co-designer of the Buchla Box, the first synthesizer built on the west coast. In the early ‘70’s, we co-authored a book, Being of the Sun, containing information about drones, modes and open tunings. In the late ‘90’s, I began partnering with Joe Gallivan, one of the pillars of the jazz fusion scene in New York and in Europe, who was the first to play a Moog drum in concert, who played in the Gil Evans Orchestra for two years and in a quartet with Larry Young for three years, and about whom an entire section is devoted in the Penguin Guide to Jazz on CD. estival in New York City in June 2000), and John B. Williams, bassist for Nancy Wilson, the Manhattan Transfer, the Tonight Show Big Band and the Arsenio Hall Show Band. I co-produced the CD with Ron Grant, an Academy Award winning film composer, who arranged and conducted some of the material, but I also relied heavily upon the improvisational skills of my great players, and they surpassed my expectations. In Performing Songwriter Magazine’s May 2007 Issue, “What Living’s All About” is one of the Editor’s 12 Top DIY Picks, and in June 2007, the first track, “Floozy Tune,” placed in the Top 20 Finalists in the Jazz Category of the Unisong International Songwriting Contest. Raves reviews of the CD appeared in eJazz News in London (written by John Stevenson, the editor), and in Feminist Review in New York City. 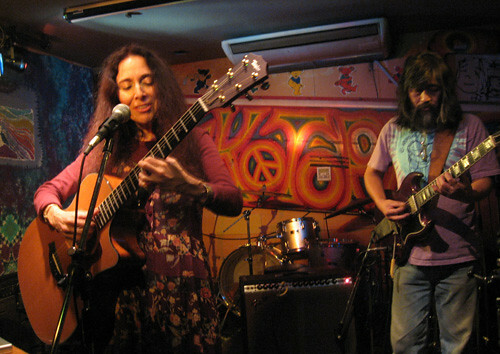 The second track, “America The Blues” was a featured download on indieguitarists.com in August 2007. In the summer of 2006, songs from “What Living’s All About” got airplay in Europe and in the USA, and in October 2006, I did eight concerts in four weeks in Japan. 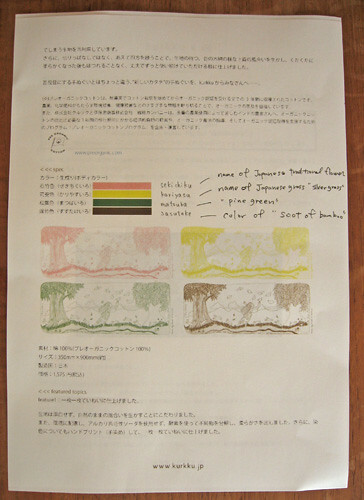 In February 2007 I did three concerts in Phoenix, where the CD has gotten a lot of play on Radio Free Phoenix, and in May and June 2007, I toured Japan again, this time performing 15 concerts, including two festivals, in seven weeks, and appearing as the subject of a TV documentary on Asahi Broadcasting Station. 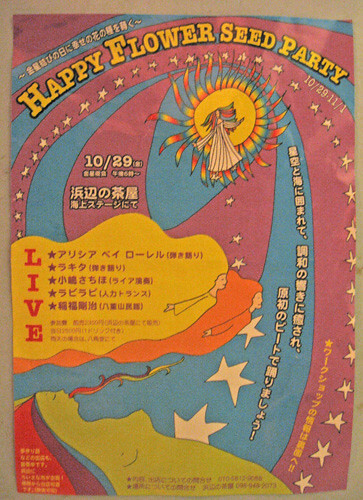 In May 2008 I return to Japan for another tour, including a concert at the opening of a gallery show of my art in Tokyo. I’m currently based in Los Angeles, working on creating an animated children’s television series that features my drawings, stories and music. Posted on July 21, 2007 by Alicia Bay Laurel	in Uncategorized and tagged biography. Yesterday I joined LinkedIn (a networking site, sort of a MySpace for grownups) at the recommendation of my co-author of Being of the Sun, composer and “post-theist visionary,” Ramon Sender. So, now I have an online resume. To check it out, click here. Posted on February 17, 2007 by Alicia Bay Laurel	in Art and tagged biography. 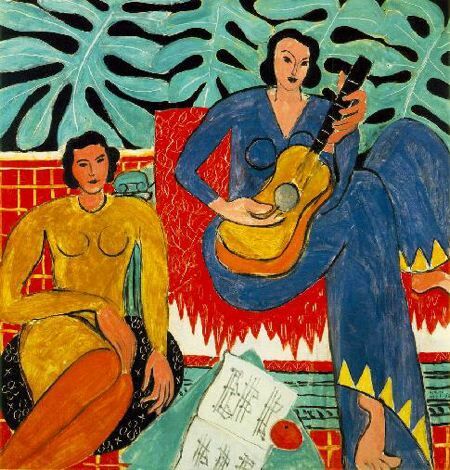 Henri Matisse showed me how to love color, women, plants, animals, and objects in a bebop sort of way. 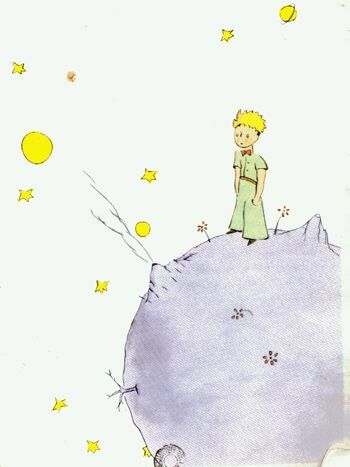 Antoine de Saint-Exupery’s The Little Prince was probably the first spiritual book in my personal library. 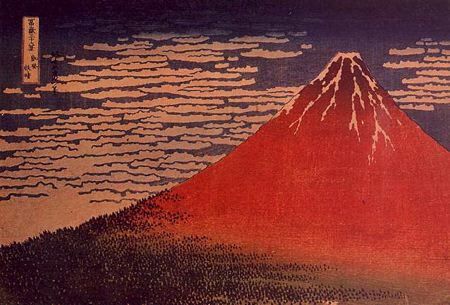 Hokusai taught me to worship volcanoes and yearn to experience life in Japan. He mingled ordinary and extraordinary visions. 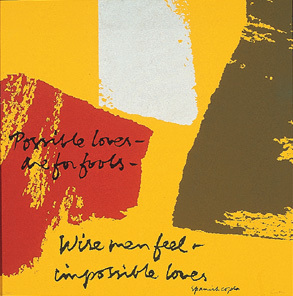 Sister Mary Corita Kent showed me the beauty of cursive script as a graphic element. My mother took art classes from her at Immaculate Heart College. 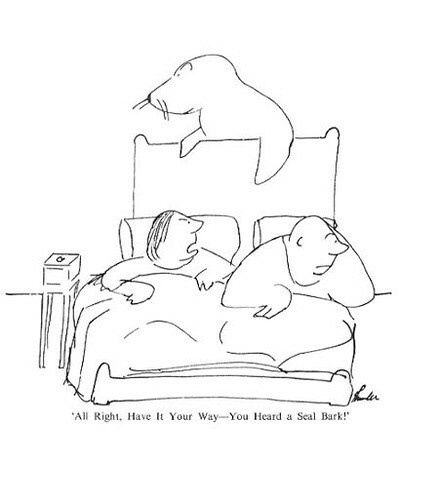 James Thurber’s work appeared monthly in our home in the New Yorker. 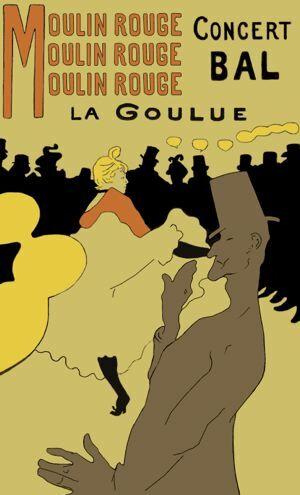 Henri de Toulouse-Lautrec showed me that distorted figures are far more evocative than photographic-perfect ones. He loved the night, and who wouldn’t in fin de siècle Paris? I’ve long loved the cartoons, illustrations, wit and political views of Jules Pfeiffer, but, to my astonishment, today I am unable to locate his bio on the web, nor examples of his cartoons, including his famous modern dancer.